The Macalope has long been a fan of the “Apple must” construction, and he’s glad to see it’s still popular. Apple will finally increase the size of the iPhone’s display from 3.5 inches to “at least four inches diagonally,” according to the Wall Street Journal. At this point, Apple has to increase the size of the iPhone’s display. Competing smartphones that run Android and Windows Phone surpassed the 3.5-inch mark years ago. … These newer HD displays work well with HD content that is available from a wide range of content sources, such as the Google Play Store, Netflix, and others. They also look darned good. As opposed to the iPhone’s Retina display, which looks like ten pounds of crap in a five-pound bag that’s already full of five pounds of crap. As much as Apple might want to stick to its own guns with respect to screen size and resolution, it would be better for Apple’s customers if Apple conformed to the 1280 x 720 spec that’s quickly becoming the norm for high-end devices. Because … why? Why is that? As is so often the case in these pieces, Zeman doesn’t say. It just is. Any parent will tell you that “Because Android OEMs are doing it” is not a valid excuse. You know, Apple may ship an iPhone with a larger screen the next time around. But if it does, it won’t be because Android devices are shipping with ludicrously large screens that require relaxed-fit pants to hold them. Apple is not in the business of chasing niche markets by boxing itself out of larger markets. No, if Apple ships an iPhone with a larger screen, it’ll be because the company thinks it’ll make for a better phone. Let the Macalope bring you up to speed about this argument that’s been raging since second-period gym class. However, despite Ultrabooks’ design similarities with Apple’s popular ultraportable, Ultrabooks really are a unique new breed of Windows laptops. In fact, in 2003—five years before Apple introduced the MacBook Air—Sony introduced another premium, super-thin laptop: The Vaio X505 (also known as the Vaio PCG-X505, or the “505 Extreme”). BOO-YAH! PRIOR ART! Yeah. Except the PCG-X505 doesn’t look anything like either a MacBook Air or, not coincidentally, like any Ultrabook the Macalope’s seen. Its “metallic body” is charcoal grey instead of aluminum and it doesn’t taper exactly like a MacBook Air, as so many Ultrabooks do. The PCG-X505 actually has an original design (if not a great one). 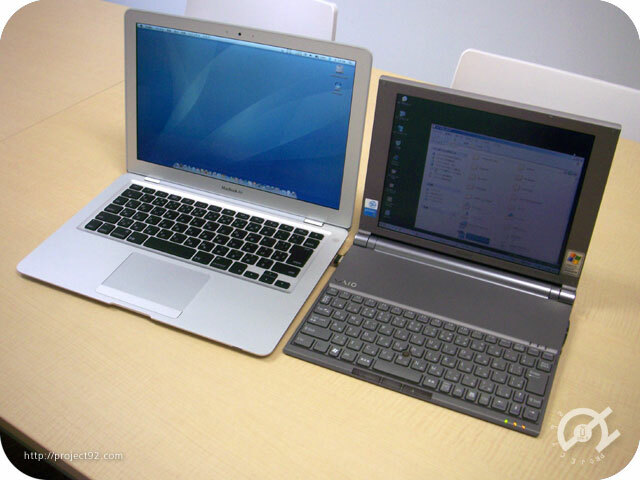 Unfortunately for Pinola’s point, it doesn’t look like current Ultrabooks. Which mostly look like the MacBook Air. Because that’s the reference platform. Is this thing on? The Macalope said all this last week. Why don’t people do the required reading? Look a little closer at some Ultrabooks that may look like MacBook Air clones, and you’ll find that laptop makers have added their own touches or improvements to the design.